In order to allow a company of any level to work correctly, it is necessary to use effectively the industrial processes and improve those which do not fulfill the requirements and expectations. The companies must be increasingly competitive if they want to keep their shares of market. It is very important to ensure a maximum satisfaction at the final Customer. To do so, we need to monitor and control each step of the process by implementing robust methods & tools. So, as a common sense all processes have statistical variability which can be evaluated by statistical methods. Statistical methods are one of the tools packages which are considered also as a Practical Problem Solving method used by experts to solve any problem. It will use different tools, from KISS (Keep It Simple Statistics: Histograms, Scatter diagrams…) to Expertise (e.g. Statistical Process Control, Hypothesis testing and Design of Experiments). It is necessary to use the right tool when many parameters are involved, to prevent the deviations and to resolve them permanently. Hypothesis testing to determine a decision by comparing specific hypothesis through simple statistical test. What about the combination of a Problem solving and a Prevention? What about mixing the PPS and the Statistics? What about SHAININ? SHAININ is the Practical Problem Solving which uses statistical tools to solve complex problems. 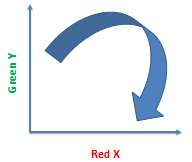 It is a tool to contain the Red X (Cause) based on the analysis of the Green Y (Effect), the aim is to combine the Red X (Problem Solving), the Green Y (Problem Prevention), Never forget to think for the Long term. It is based on the identification of the causes through the analysis of the effects to fix the problems permanently, so they never come back. So, SHAININ has exceeded the way of thinking of the statisticians…True Story or Just a Legend? To comment and continue the debate go to this post on LinkedIn, contribute to the discussion!